Larry likes it low!" I sometimes say. It can make the student laugh, a good thing since learning to sing can be serious business, the kind of which shouldn't be taken so seriously that it becomes impossible. 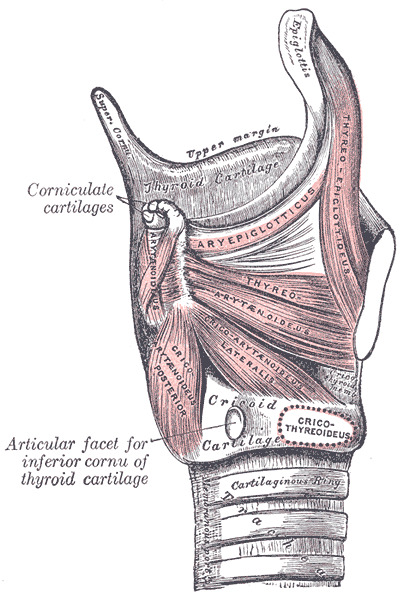 Anyone who has studied Manuel García's works and that of his students knows that the larynx lowers slightly while the soft palate rises in making rounded tone. But there is a huge difference in observing this with the eye or finger and while singing. It's the difference between objective and subjective knowledge. The problem comes when confusing the two perceptions. And what is this difference practically speaking? 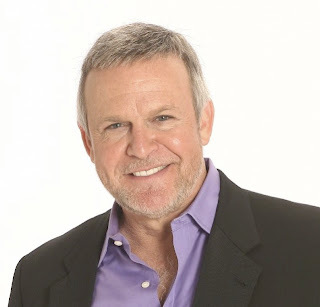 Put your finger on your larynx and speak or sing a clear & rich chiaroscuro tone in the lower range and Larry will be felt to have descended slightly. Make it go down mechanically and then try to sing a rich chiaroscuro tone and it will come out bungled. Why? Because there is a difference between cause and effect. The Old Italian School taught that The Italian Singer has no throat. Another way to say this is that being aware of your larynx or throat during singing is a sign that something is wrong. It is a fact that one can teach the singer to make beautifully rounded tones and not mention the larynx or soft palate at all. Getting the right tonal value into the consciousness via imitation is the key. It has to be heard in the studio. Once the student's ear has wrapped itself around the experience, the self-aware student may spontaneously comment about where they feel Larry to be in comparison to where he was before. (The student may say the throat is 'open.') Then again, they may not be aware of Larry at all unless you ask them. Should you ask them? That's a good question. Being aware of mechanics isn't a good thing in my estimation until the student's singing is very stable. 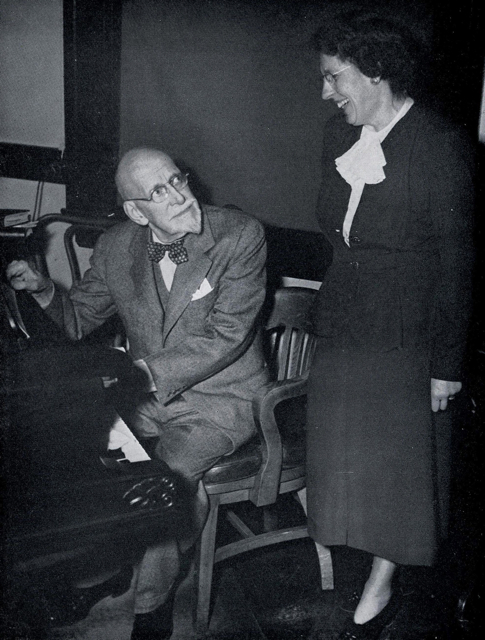 This is why I believe the famous voice teacher Anna E. Schoen-René (a student of Manuel García and Pauline Viardot-García) noted the following in her book, America's Musical Inheritance (1941): "Scientific explanations can only be grasped by singers already educated in the principals of their art." Being educated in the principals of bel canto is first a matter of the ear, then the eye. Subjective experience, then objective experience/understanding. One leads the other. Putting the eye before the ear is putting the cart before the horse. Strange to say, but the first time I heard Gian Carlo Menotti's opera The Consul, I was in high school, babysitting the neighbors two kids. They went to bed early and I amused myself by channel surfing, stumbling on Menotti's opera just as it started on PBS's Great Performances. I was shocked by the story, musical language and the main aria "To this we've come." Its hopeful consonance in the middle of the dissonant bleak work made a huge impact on my 17 year old brain. Menotti's opera was the first I ever saw from beginning to end if you don't count my first performance in opera being Carmen. I was in third grade and sang in the children's chorus, but I digress! The soprano who created the role of Magda Sorel in The Consul was Particia Neway, who recently died at the age of 92 (see Theatre Aficionado at Large), having sung 269 performances of Menotti's opera. She sang at a time when 'crossover' meant something different that it does now, my point being that Neway sang on Broadway in major roles with operatic technique. She won a Tony as the Mother Abbess in The Sound of Music. Look closely and you will find Tatiana Troyanos singing in the chorus. The choral singing is full-bodied and womanly, with none of the hooty or straightened approach you find today. All too often, choral directors try to find 'blend' by limiting rather than expanding. This may have everything to do with the fact that many conductors today aren't singers. At any rate, the choral approach of Neway's time on Broadway was classically driven, a very different approach than can be heard today. Here is Neway accepting her Tony Award in 1960. You can find Neway in Menotti's The Consul on DVD here. What a beautifully burnished voice. 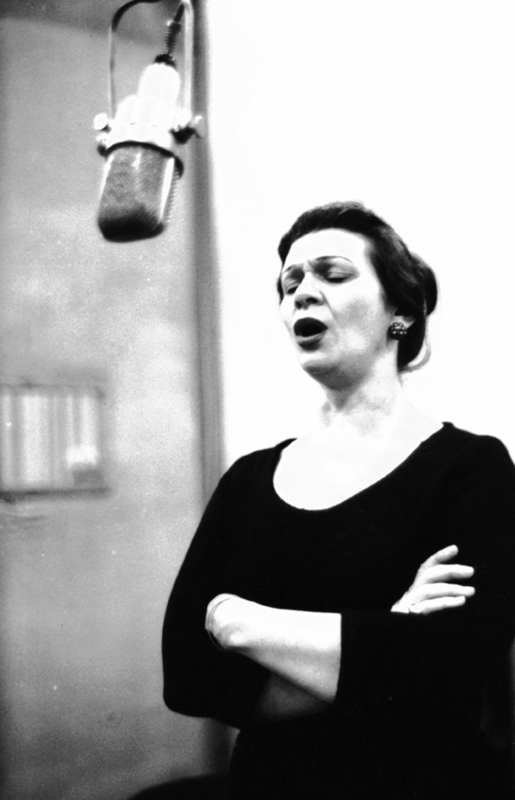 She sang a great deal at The New York City Opera, back when its home was The City Center of Music and Drama on 55th Street. Postscript 2/1/12: The New York Times finally published Newway's obitiuary which you can find here. I went to see Stephen Sondheim's legendary show Follies last week which was in the last week of its New York run (it closed on Sunday and is moving to Los Angeles). Among the many luminaries in the cast was Ron Raines. As fate would have it, I went to see my barber yesterday and who was in the chair ahead of me? None other than Mr. Raines. Introductions were made and it was a pleasure to shake his hand and tell him how much I enjoyed his performance. He's fantastic. Ron Raines has been hitting it out of the park eight shows a week, singing and acting with such authenticity that it makes your heart ache. In the character of Benjamin Stone, Raines swaggers in at the beginning of Act 1, bluster and bitterness on his breath. But by the end of Act 2, when sitting in a puddle of confetti on the floor, Raines as Ben has burned his way into your consciousness. You know this man, especially if you are over 40, Raines making you feel underneath Ben's hard shell. No smoke and mirrors here. How does he do it? With his voice, of course. Rains has real technique, vocal and otherwise, which serve the story. In an interview between Raines and his co-star Elaine Page at the American Theatre Wing's website (which you can listen to the full interview here), Page asks Raines about the difference between singing opera and theatre, which, coincidentally, both have done at New York City Opera: Page in Sweeny Todd and Raines in The Merry Widow and New Moon. Page: "Is there a difference, you know, in terms of the art of it?" Rains: "Not for me. I keep trying to learn how to sing and tell a story." Page then goes on to relate how Sondheim wants singers to sing, not talk his songs. Technique isn't something you can buy like a carton of milk on the corner. It isn't a product. It's an art and a craft- a way of life. Yes. You need someone to show you the 'how' of it. But the teacher also needs a great student, someone who does more than stand there, waiting for fame and fortune to come with no effort involved. The truth is: the really great performers never stop learning. And Ron Raines hasn't. Don't miss this consummate artist in Los Angeles. Readers who have followed the continuing saga of the NYCO archives will be saddened to learn that the orchestra and chorus were locked out of rehearsals today after a weekend of mediation- an action which presages the end of the company. This morning, I read (Facebook) the following letter from my colleague Amanda Edge who appeared in NYCO's La Traviata at the State Theater in Lincoln Center of the Performing Arts. I want to thank Amanda for allowing me to reprint her words on this page. She expresses the feelings and thoughts of hundreds of company members who have given their lives, love and art to a once glittering, prestigious and groundbreaking arts organization. A Lincoln Center arts organization representing itself with a black hole. A marketing campaign featuring a smashed car and a man dressed like a gangster. An obscure repertoire with no proven public appeal. A general manager/artistic director with no experience running an opera company. Is it so difficult to venture that the decline of New York City Opera is not the inevitable result of a sagging economy, but is due instead to questionable-to-terrible repertory choices and gross mismanagement? Actually, there is little evidence to suggest that New York City Opera’s current management didn’t purposefully send the company into a nosedive. I had the honor of dancing with the company in 2007, as the gypsy in New York City Opera’s popular La Traviata. And my longtime boyfriend Billy was – until this meltdown - the last remaining dancer on contract. So, full disclosure: my interest in NYCO definitely lands firmly on the side of the artists, the choristers, orchestra members, stage managers, and assistant directors. However, as someone with a 20-year performing career (New York City Ballet, Broadway’s Phantom of the Opera, and Twyla Tharp’s Come Fly Away), and as an opera-goer who has attended NYCO for over 2 decades (long before I ever met Billy in State Theater’s elevator #7) I also think I have a relatively educated idea of what’s good, and what audiences want to see. A personal survey of my trips to the theater over the past several years proves that the arts at Lincoln Center – and in the city - thrive when savvy choices are made. While the stock market imploded in 2008, South Pacific played to sold-out crowds at the Vivian Beaumont and extended its limited run. The stunning production earned 7 Tony Awards and ran for over two years. The New York Philharmonic continues to present appealing programs, giving us Brahms, Beethoven, Stravinsky, and Ravel, as well as Gershwin and Cole Porter. We’re buying tickets. At what will always be the New York State Theater to me, New York City Ballet has been thrilling audiences: Wendy Whelan in Diamonds or the drum regiment of Union Jack; Tiler Peck in Tchaikovsky Pas de Deux; Daniel Ulbricht in Prodigal Son. What’s not to love? The Nutcracker was presented Live From Lincoln Center (on PBS and aired in movie theaters). Someone named Paul McCartney recently composed a score for the company. And, when New York City Opera sold a handful of their weeks to NYCB last year, story ballets like Midsummer Night’s Dream, Coppélia, and The Sleeping Beauty put families in the seats. American Ballet Theatre’s Giselle at the Metropolitan Opera House last Spring: The 170-year old ballet was a hit, and the packed house jumped to its feet as the curtain closed. Thunderous applause and appreciative shouts filled the cavernous Met, and a number of fans rushed to the foot of the stage. The School of American Ballet’s Gala Workshop at Julliard’s Peter Jay Sharpe Theater: The performance garnered a response that was loud, long, effusive and genuine as the ticket-buyers (who were not just parents!) enthusiastically celebrated a new group of future dance stars. There was not an empty seat at City Center this past November as the dancers of American Ballet Theatre soared in Twyla Tharp’s In the Upper Room. Billy Elliot, a phenomenal show that closed on Broadway this evening, won 10 Tony Awards and ran for over 3 years. We saw it twice, and would have gone back tonight if any tickets had been available. War Horse at the Vivian Beaumont: The magical puppets have been entertaining a captivated house, and it garnered 6 Tony Awards last year. I think there’s a puppet at New York City Opera too, but he’s of an entirely different sort. Last year, while New York City Opera’s sparse, dissonant, and abysmal (and very expensive to mount) Monodramas was critically acclaimed in the New York Times, the glowing review of opening night neglected to mention that the theater was over 60% papered. As a 16-year old studying at the School of American Ballet, I often signed out of my dorm room to cross the plaza and see New York City Opera. Standing room tickets were $10, and I attended beautiful productions of Madame Butterfly and Carmen. Charlie Wigler, a counselor at SAB, noticed my interest in opera; he asked if I had ever seen Cavalleria Rusticana and Pagliacci. I hadn’t, so a couple of days later he took my classmate, ABT’s Paloma Herrera, and me to the double bill, where we spotted Placido Domingo in the audience. The performance was riveting, and I was hooked. In the following years, I became a regular, attending tremendous productions of The Mikado, The Ballad of Baby Doe, H.M.S. Pinafore, Rigoletto, Brigadoon, Die Tote Stadt, Semele, Rinaldo, Candide, Carmina Burana, Prince Igor, La Rondine, and more (not typical offerings at the Metropolitan Opera). I listened to recordings of Boito’s Classical Sabbath from Mefistofele, and of Beverly Sills singing Villa from The Merry Widow. In both cases, I wept. This weekend, the artists of New York City Opera were left to reject an insulting offer of $4000/year without health insurance (while George Steel makes $400,000/year in a true example of the 1% in America). What Steel, Charles Wall, and NYCO’s board have done is unconscionable; the pompous, selfish, elitist group has blithely defaced the people’s opera. The artists of the company, who were offered 80% below the 2011 national poverty level of $22,350, are the casualties of war. It appears that New York has lost New York City Opera, once a vibrant jewel in the artistic crown of this great city. Download Beverly “Bubbles” Sills singing Villa. Sip a quality wine. And mourn the loss of her company. His book is on Kindle now, did you know that? Yes-sir-ee. 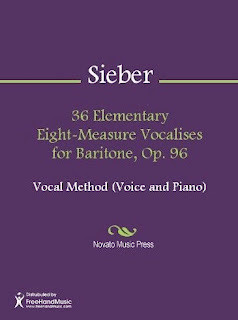 You can now download Ferdinand Sieber's (1822-1895) book of vocal exercises for baritone for your Kindle (he wrote many books of vocal exercises which you will find with google). 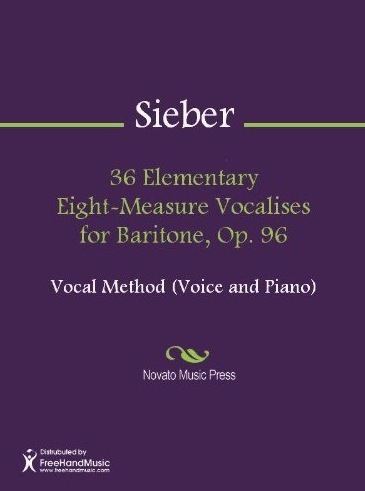 While you may have used Sieber's books of exercises in the past, or saw them on a shelf in a music library, I am guessing you didn't know who he was. I remember seeing the book below at Patelson's Music Store behind Carnegie Hall some years ago before it closed. But I didn't know who Sieber was until I starting doing research on Anna E. Schoen-Rene (1864-1942), the musical daughter of Manuel Garcia and Pauline Viardot-Garcia. Schoen-Rene had lessons with Sieber in Berlin as a young woman before studying with PaulineViardot-Garcia in Paris in the 1880's. Sieber also wrote a book on singing titled Katechismus der Gesangskunst (1885). I found a copy of the English translation - The Art of Singing, and Voice Culture (1908) - at Abebooks. Reading it, one gleans that he was an Old School boy. Though Sieber did not have the enduring fame that has been accorded to Francesco Lamperti and Manuel Garcia, he was considered one of the foremost exponents of the Old Italian School. Ok. So perhaps the 'greatest living exponent of the old Italian method' was stretching things a bit. After all, Manuel Garcia and his sister weren't dead yet. And they could trace their pedagogical descent through their father, Manuel Garcia the Elder, who studied with Giovanni Anzani, a student of the great Nicola Porpora. 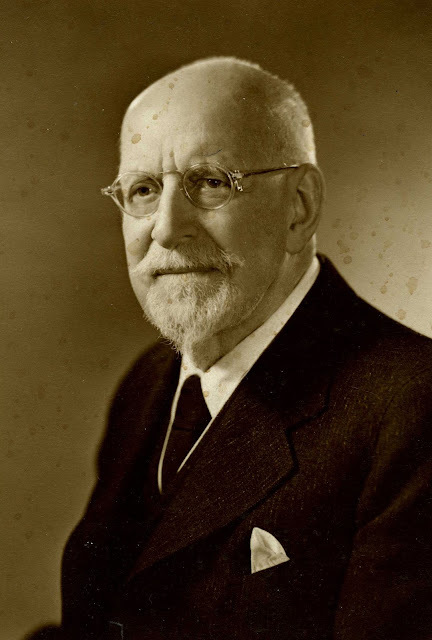 What was Seiber's lineage? He studied voice with Gorgio Ronconi, the famous Verdi baritone. And Ronconi was a student of his father, who had studied with a Venetian vocal master in the late 18th century. No small potatoes that. While visiting my parents over the weekend (New Year's Day is also my father's birthday) I found a cassette tape in the bottom of a box. A talisman of time travel, it was a recording I had made in 1990 and had totally forgotten about. I had been singing at New York City Opera for two years and was approached to record a song - She Walks in Beauty- that had been commissioned by a patron for the New York Philharmonic. I met with the composer Joseph Turrin, coached the song and then recorded it at a studio in midtown in two takes a week later. Another piece - Lullaby - was added at the last minute and was recorded in one take. That was quick! Being a busy thirty-two year old, I put the cassette in a box when it arrived in the mail a few weeks later and went on with my life. It's a curious experience hearing yourself after so many years. You hear not only the voice, but who you were and weren't, what you knew without being taught, and what you had yet to learn. In this case, I hear that my right ear had not yet fully awakened, a process that began after I went to the Listening Center in Toronto in 1999. Oh, but I was a young man. Unlike Benjamin Stone in Follies, I do remember him. He idolized Gerald Souzay and listened to everything he recorded.